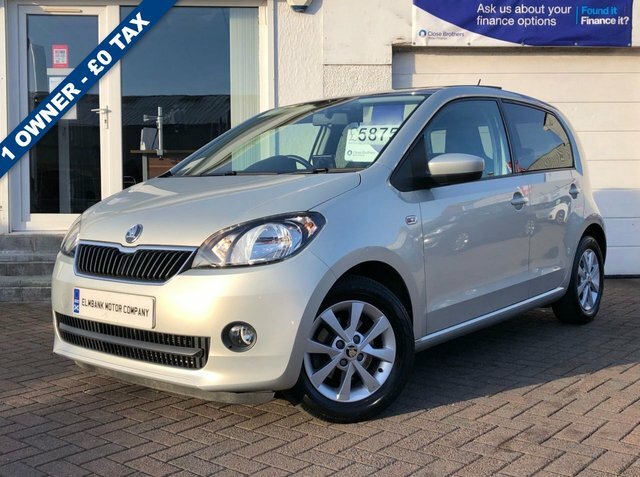 2014 63 SKODA CITIGO 1.0 ELEGANCE GREEN TECH. A VERY WELL PRESENTED CAR ON OFFER, LOVELY COLOUR AND IN EXCELLENT ORDER INSIDE AND OUT. ON BOARD SPECIFICATION INCLUDES ALLOY WHEELS, CD-RADIO, PARK ASSIST, HEATED SEATS, REAR PRIVACY GLASS, BLUETOOTH AND TOUCH SCREEN NAVIGATION. £0 ROAD TAX PER ANNUM AND ONLY ONE OWNER FROM NEW WITH A FULL SKODA SERVICE RECORD. WE WELCOME ANY AA OR RAC INSPECTION AND CAN OFFER BESPOKE FINANCE PACKAGES. TO ARRANGE A VIEWING OR TEST DRIVE PLEASE CALL ELMBANK MOTOR COMPANY AYR ON 01292 292991.